The history of the Jews in Romania concerns the Jews both of Romania and of Romanian origins, from their first mention on what is present-day Romanian territory. 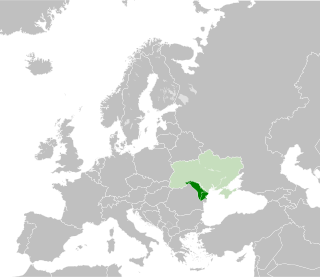 Minimal until the 18th century, the size of the Jewish population increased after around 1850, and more especially after the establishment of Greater Romania in the aftermath of World War I. A diverse community, albeit an overwhelmingly urban one, Jews were a target of religious persecution and racism in Romanian society – from the late-19th century debate over the "Jewish Question" and the Jewish residents' right to citizenship, to the genocide carried out in the lands of Romania as part of the Holocaust. The latter, coupled with successive waves of aliyah , has accounted for a dramatic decrease in the overall size of Romania's present-day Jewish community. Blood libel or ritual murder libel is an antisemitic canard falsely accusing Jews of kidnapping and murdering Christian children in order to use their blood as part of religious rituals. Historically, these claims—alongside those of well poisoning and host desecration—have been a major theme of the persecution of Jews in Europe. 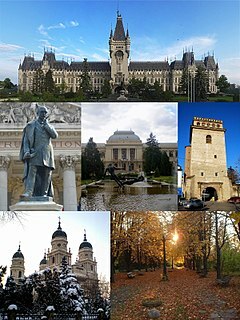 Târgu Neamț is a town in Neamț County, Romania, on the Neamț River. It had, as of 2002, a population of 20,496. Three villages are administered by the town: Blebea, Humulești and Humuleștii Noi. The National Legionary State was a totalitarian fascist regime which governed the Eastern European country of Romania for five months, from 14 September 1940 until its official dissolution on 14 February 1941. The regime was led by the Iron Guard in partnership with General Ion Antonescu. While the Guard had been present in the Romanian Government since 28 June 1940, it was only on 14 September when it achieved dominance, leading to the proclamation of the National Legionary State. The Iron Guard is the name most commonly given to a far-right movement and political party in Romania in the period from 1927 into the early part of World War II. Founded by Corneliu Codreanu, it is also known as the Legion of the Archangel Michael or the Legionnaire movement. The Iron Guard was ultra-nationalist, antisemitic, antiziganist, anti-communist, anti-capitalist and promoted Eastern Orthodox Christianity. Its members were called "Greenshirts" because of the predominantly green uniforms they wore. On the current territory of Romania, between 290,000 and 360,000 Romanian Jews survived World War II (355,972 persons, according to statistics from the end of the war). During the communist regime in Romania, there was a mass emigration to Israel, and in 1987, only 23,000 Jews lived in Romania. Romanian Jews in Israel refers to the community of Romanian Jews who migrated to Palestine beginning in the later 19th century, continued migrating to Israel after the formation of the modern state in 1948, and live within the state of Israel. The descendants of those who made aliyah in 1930s, the wave of emigrants after World War II or after the fall of communism, with their children and grandchildren born in Israel, represent about 10% of the population. According to the Association of Romanian Journalists Abroad, about 400,000 Romanian Jews live in Israel. Most of them have higher education, occupying important positions in various sectors and making a great contribution to the economic, social and cultural development of Israel. They have established several kibbutzim, moshavim and towns. Between 1882 and 1884, Romanian Jews in Israel already established nine localities. Prince Roman I (1391-1394?) exempted the Jews from military service, in exchange for a tax of 3 löwenthaler per person. Also in Moldavia, Stephen the Great (1457–1504) treated Jews with consideration. Isaac ben Benjamin Shor of Iași (Isak Bey , originally employed by Uzun Hassan) was appointed stolnic , being subsequently advanced to the rank of logofăt ; he continued to hold this office under Bogdan the Blind (1504–1517), the son and successor of Stephen. During the first short reign of Peter the Lame (1574–1579) the Jews of Moldavia, mainly traders from Poland who were competing with locals, were taxed and ultimately expelled. In 1582, he succeeded in regaining his rule over the country with the help of the Jewish physician Benveniste, who was a friend of the influential Solomon Ashkenazi;  the latter then exerted his influence with the Prince in favor of his coreligionists. The first blood accusation in Moldavia (and, as such, in Romania) was made April 5, 1710, when the Jews of Târgu Neamț were charged with having killed a Christian child for ritual purposes´. The instigator was a baptized Jew who had helped to carry the body of a child, murdered by Christians, into the courtyard of the synagogue [ citation needed ]. On the next day five Jews were killed, others were maimed, and every Jewish house was pillaged, while the representatives of the community were imprisoned and tortured. Meanwhile, some influential Jews appealed to Prince Nicholas Mavrocordatos (the first Phanariote ruler) in Iași, who ordered an investigation resulting in the freeing of those arrested. This was the first time that the Orthodox clergy participated in attacks on Jews. It was due to the clergy's instigations that in 1714 a similar charge was brought against the Jews of the city of Roman - the murder by a group of Roman Catholics of a Christian girl-servant to Jewish family was immediately blamed on Jews; every Jewish house was plundered, and two prominent Jews were hanged, before the real criminals were discovered by the authorities. When Charles von Hohenzollern succeeded Cuza in 1866 as Carol I of Romania, the first event that confronted him in the capital was a riot against the Jews. A draft of a constitution was then submitted by the government, Article 6 of which declared that "religion is no obstacle to citizenship"; but, "with regard to the Jews, a special law will have to be framed in order to regulate their admission to naturalization and also to civil rights". On June 30, 1866, the Bucharest Synagogue was desecrated and demolished (it was rebuilt in the same year, then restored in 1932 and 1945). Many Jews were beaten, maimed, and robbed. As a result, Article 6 was withdrawn and Article 7 was added to the 1866 Constitution; it read that "only such aliens as are of the Christian faith may obtain citizenship". For the following decades, the issue of Jewish rights occupied the forefront of the Regat's political scene. With few notable exceptions (including some of Junimea affiliates  — Petre P. Carp, George Panu, and I.L. Caragiale), most Romanian intellectuals began professing antisemitism; its most virulent form was the one present with advocates of Liberalism (in contradiction to their 1848 political roots), especially Moldavians, who argued that Jewish immigration had prevented the rise of an ethnic Romanian middle class. The first examples of modern prejudice were the Moldavian Fracțiunea liberă și independentă (later blended into the National Liberal Party, PNL) and the Bucharest group formed around Cezar Bolliac. Their discourse saw Jews as non-assimilated and perpetually foreign - this claim was, however, challenged by some contemporary sources,  and by the eventual acceptance of all immigrants other than Jews. Antisemitism was carried into the PNL's mainstream, and was officially enforced under the premierships of Ion Brătianu. During his first years in office, Brătianu reinforced and applied old discrimination laws, insisting that Jews were not allowed to settle in the countryside (and relocating those that had done so), while declaring many Jewish urban inhabitants to be vagrants and expelling them from the country. According to the 1905 Jewish Encyclopedia : "A number of such Jews who proved their Romanian birth were forced across the Danube, and when [the Ottoman Empire] refused to receive them, were thrown into the river and drowned. Almost every country in Europe was shocked at these barbarities. The Romanian government was warned by the powers; and Brătianu was subsequently dismissed from office". Cabinets formed by the Conservative Party, although including Junimea's leaders, did not do much to improve the Jews' condition - mainly due to PNL opposition. When Brătianu resumed leadership, Romania faced the emerging conflict in the Balkans, and saw its chance to declare independence from Ottoman suzerainty by dispatching its troops on the Russian side in the Russo-Turkish War of 1877–1878. The war was concluded by the Treaty of Berlin (1878), which stipulated (Article 44) that the non-Christians in Romania (including both Jews and Muslims in the newly acquired region of Northern Dobruja) should receive full citizenship. After a prolonged debate at home and diplomatic negotiations abroad, the Romanian government ultimately agreed (1879) to abrogate Article 7 of its constitution. This was, however, reformulated to make procedures very difficult: "the naturalization of aliens not under foreign protection should in every individual case be decided by Parliament" (the action involved, among others, a ten-year term before the applicant was given an evaluation). The gesture was doubled by a show of compliance - 883 Jews, participants in the war, were naturalized in a body by a vote of both chambers. World War I, during which 882 Jewish soldiers died defending Romania (825 were decorated), brought about the creation of Greater Romania after the 1919 Paris Peace Conference and subsequent treaties. The enlarged state had an increased Jewish population, corresponding with the addition of communities in Bessarabia, Bukovina, and Transylvania. On signing the treaties, Romania agreed to change its policy towards the Jews, promising to award them both citizenship and minority rights, the effective emancipation of Jews. The 1923 Constitution of Romania sanctioned these requirements, meeting opposition from Cuza's National-Christian Defense League and rioting by far right students in Iași;  the land reform carried out by the Ion I. C. Brătianu cabinet also settled problems connected with land tenancy. Political representation for the Jewish community in the inter-war period was divided between the Jewish Party and the Federation of Jewish Communities of Romania  (the latter was re-established after 1989). During the same period, a division in ritual became apparent between Reform Jews in Transylvania and usually Orthodox ones in the rest of the country  (while Bessarabia was the most open to Zionism and especially the socialist Labor Zionism). Between the establishment of the National Legionary State and 1942, 80 anti-Jewish regulations were passed. Starting at the end of October, 1940, the Iron Guard began a massive antisemitic campaign, torturing and beating Jews and looting their shops (see Dorohoi Pogrom ), culminating in the failed coup and a pogrom in Bucharest, in which 120 Jews were killed. Antonescu eventually stopped the violence and chaos created by the Iron Guard by brutally suppressing the rebellion, but continued the policy of oppression and massacre of Jews, and, to a lesser extent, of Roma. 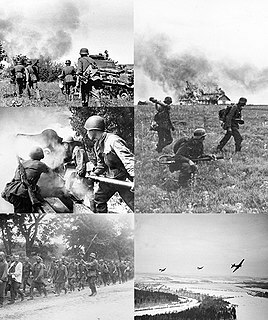 Further killings perpetrated by Antonescu's death squads (documents prove his direct orders[ citation needed ]) in collaboration with the German Einsatzkommando, the SS squads of local Ukrainian Germans (Sonderkommando Russland and Selbstschutz), and the Ukrainian militia targeted the local Jewish population that the Romanian Army managed to round up when occupying Transnistria. Over one hundred thousand of these were killed in massacres staged in such places as Odessa (see Odessa massacre), Bogdanovka, Akmechetka, Pechora in 1941 and 1942. The change in policy toward the Jews began in October 1942, and by March-April 1943, Antonescu permanently stopped all deportations despite German pressure,  as he began to seek peace with the Allies, although at the same time he levied heavy taxes and forced labor on the remaining Jewish communities. Also, sometimes with the encouragement of Antonescu's regime, thirteen boats left Romania for the British Mandate of Palestine during the war, carrying 13,000 Jews (two of these ships were sunk by the Soviets (see Struma disaster), and the effort was discontinued after German pressure was applied). During the postwar period, the history of the Holocaust was distorted or simply ignored by East European communist regimes. The trials of war criminals began in 1945 and continued until the early 1950s, but they received public attention only for a short period of time. In postcommunist Romania, Holocaust denial has been a diffuse phenomenon, and until 2004, when researchers made numerous documents publicly available, many in Romania denied knowledge that their country participated in the Holocaust. The Romanian government has recognized that a Holocaust took place on its territory and held its first Holocaust Day in 2004. In memory of the victims of the Holocaust and particularly to reflecting on Romania's role in the Holocaust, the Romanian government decided to make October 9 the National Day of Commemorating the Holocaust. 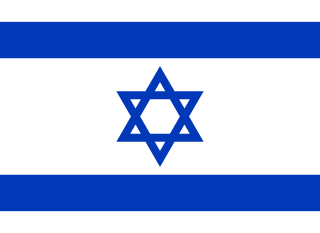 During the Cold War, Romania was the only communist country not to break its diplomatic relations with Israel. Throughout the period of Communist rule, Romania allowed limited numbers of Jews to emigrate to Israel, in exchange for much-needed Israeli economic aid. By 1965, Israel was funding agricultural and industrial projects throughout Romania, and in exchange, Romania allowed limited numbers of Jews to emigrate to Israel. The 1930 census was the only one to cover Greater Romania. Censuses in 1948, 1956, 1966, 1977, 1992, 2002 and 2011 covered Romania's present-day territory. All but the 1948 census, which asked about mother tongue, had a question on ethnicity. Moldavia and Wallachia each held a census in 1859. The Romanian Old Kingdom (Regat) conducted statistical estimates in 1884, 1889 and 1894, and held censuses in 1899 and 1912. Ion Antonescu's regime also held two: a general one in April 1941, and one for those with "Jewish blood" in May 1942. ↑ "Comunitatea evreilor din România s-a împuţinat teribil, însă aceştia "sunt mai ales exemple de moralitate"" . Retrieved 2019-01-28. ↑ "PM Sharon Meets Romanian PM". Prime Minister's Office. 1 2 3 4 5 6 7 8 9 10 11 12 International Commission on the Holocaust in Romania (2012-01-28). "Executive Summary: Historical Findings and Recommendations" (PDF). Final Report of the International Commission on the Holocaust in Romania. Yad Vashem (The Holocaust Martyrs' and Heroes' Remembrance Authority). Retrieved 2012-01-28. 1 2 Alexandru Florin-Platon. "O necesară restituţie biografică (Carol Iancu, Alexandru Şafran: o viaţă de luptă, o rază de lumină)". Revista Contrafort . Retrieved 2019-01-28. ↑ "Romania holds first Holocaust Day". BBC News . 12 October 2004. Retrieved 24 September 2013. 1 2 3 "Buying Romania's Jews". The Washington Post . January 14, 1990. ↑ "The Jewish Community of Bucharest". Beit Hatfutsot Open Databases Project. The Museum of the Jewish People at Beit Hatfutsot. Ion Antonescu was a Romanian soldier and authoritarian politician who, as the Prime Minister and Conducător during most of World War II, presided over two successive wartime dictatorships. After the war, he was convicted of war crimes and executed. Corneliu Zelea Codreanu, commonly known as Corneliu Codreanu, was a Romanian politician who was the founder and charismatic leader of the Iron Guard, an ultranationalistic, antisemitic, Magyarophobic, and anti-gypsy organization active throughout most of the interwar period. Generally seen as the main variety of local fascism, and noted for its Romanian Orthodox-inspired revolutionary message, the Iron Guard grew into an important actor on the Romanian political stage, coming into conflict with the political establishment and democratic forces. The Legionnaires traditionally referred to Codreanu as Căpitanul, and he held absolute authority over the organization until his death. Traian Popovici was a Romanian lawyer and mayor of Cernăuţi during World War II, known for saving 20,000 Jews of Bukovina from deportation. The history of the Jews in Bessarabia, a historical region in Eastern Europe, dates back hundreds of years. The Iași pogrom of 29 June 1941 was a series of pogroms launched by governmental forces under Ion Antonescu in the Romanian city of Iaşi against its Jewish population, resulting in the murder of at least 13,266 Jews, according to Romanian authorities. Wilhelm Filderman was a lawyer, communal leader, and the leader of the Romanian-Jewish community between 1919 and 1947; in addition, he was a representative of the Jews in the Romanian parliament. Sfarmă-Piatră was an antisemitic daily, monthly and later weekly newspaper, published in Romania during the late 1930s and early 1940s. One in a series of publications founded by Nichifor Crainic, with support from Universul editor-in-chief Stelian Popescu, it attempted to regroup the various fascist and pro-fascist movements around Crainic's "ethnocratic" principle. The editorial staff comprised a group of far right intellectuals; alongside the editor-in-chief Alexandru Gregorian, they included Ovidiu Papadima, Vintilă Horia, Dan Botta, Dragoș Protopopescu, Toma Vlădescu, and Pan M. Vizirescu. It notably hosted contributions by writers Ioan Alexandru Brătescu-Voinești, Radu Gyr and Ștefan Baciu. A series of antisemitic laws in Romania existed since the creation of the modern state of Romania in mid-19th century, but their number and scope was greatly expanded in the late-1930s and 1940s culminating with the Holocaust in Romania. Ronetti Roman was an Imperial Austrian-born Romanian playwright and poet. Likely a native of Galicia, he settled permanently in Romania in the mid-1870s. Across the ensuing three decades, he made a name for himself as a polemical journalist, also writing poetry and satire, and concerning himself with the status of the country's Jews. His chief literary contribution was the 1900 play Manasse, which explores the intergenerational conflict between older, devout, tradition-bound Jews and their more secular, modern, assimilated descendants. While very successful with audiences, the play also drew fire from nationalist circles that took to the streets to block its staging on two separate occasions. Abraham Leib Zissu was a Romanian writer, political essayist, industrialist, and spokesman of the Jewish Romanian community. Of lowly social origin and a recipient of Hasidic education, he became a noted cultural activist, polemicist, and newspaper founder, remembered primarily for his Mântuirea daily. By the end of World War I, he emerged as a theorist of Religious Zionism, preferring communitarianism and self-segregation to the assimilationist option, while also promoting literary modernism in his activity as novelist, dramatist, and cultural sponsor. He was the inspiration behind the Jewish Party, which competed with the mainstream Union of Romanian Jews for the Jewish vote. Zissu and Union leader Wilhelm Filderman had a lifelong disputation over religious and practical politics. Wikimedia Commons has media related to Jewish people of Romania .